Drinking isn’t complete without a fine whiskey glass to drink it with. Yes, you can drink it with a normal shot glass, but the feel is just different. As we grow older our tastes in whiskey don’t only depend on the liquor. Other factors come into play to bring us the best experience there is. Before, drinking expensive liquor used to be the best experience that you could ever hope for. But as time passes by, drinking expensive whiskey doesn’t seem enough. To further elevate the experience of drinking liquor, you could always drink it in a fancy whiskey glass. Although drinking it in expensive whiskey glasses doesn’t improve the taste. I will still improve and elevate your experience in drinking your favorite liquor at home. Some of these glasses might have some unique effects that add a little something to your drinking experience. There are numerous reasons why you need to buy a whiskey glass. While some of these reasons are rather unreasonable and impractical. Sometimes you need to be unreasonable and impractical just to get the best experience out of this dilemma. The main reason why you need to buy this is that you’re giving respect to the liquor that you’re about to partake. This holds true especially if you’re drinking expensive whiskey at home. Expensive liquor shouldn’t be drunk in some cheap glass, it should be drunk with class. Another reason is that it elevates the experience of drinking liquor. This might sound over the top, but let’s be honest, who doesn’t want to drink their favorite whiskey in a fancy and sophisticated glass? I know I will. You could also use this moment to show and tell your friends and family about your classy glass. Now that you have an idea on what a whiskey glass is and why you need to buy one. It’s time to know what are the best glasses available in the market today. To give you a head start, we’ve reviewed some of the best glasses that you might be in to. If you’re looking for a glass that’s fit for royalty, then you might want to consider buying the Glencairn Whisky Glass by Glencairn. This award-winning glass is being considered to be the official glass for drinking Scotch. A worthy vessel to hold any expensive liquor at your disposal. It has a very slim finish that’s pleasing to the hand to hold. The slender body of the glass enhances the aroma of the liquor inside of the glass. It’s made from a lead-free crystal that’s made directly by Glencairn, the glass is delicate so we suggest that you handle it with care. If you’re looking for a nature-inspired glass that could capture the essence of the liquor that you’re drinking then you might want to buy the Set of 2 Whisky Glass by Norlan. This special glass is specifically crafted by master distiller McEwan. This glass is being designed to bring out the best aroma of the whiskey and deliver it to your senses. It’s made from a double walled vessel that has a transparent glass. The aesthetics and beauty of this glass is something you want to drink your liquor in. If you’re looking for glassware that is being handcrafted and has an elegant look and feels to it. Then you might want to buy the Ashcroft Whiskey Glasses by Ashcroft Fine Glassware. This piece of glass is perfect for drinking whiskey neat. The glass can fit any hand size because of its beautiful design. What makes this glass stand out is that it’s made from 100% lead-free glass. It also has an impressive clear finish that you can see the liquor sitting on the glass. This hand-blown whiskey glass is the only glass that you’ll need. The .308 Real Bullet Whiskey Glass by Lucky Shot is being made with a real .308 caliber bullet. This glass is beyond awesome especially for those who are into guns and ammunition. This glass is a perfect gift for those who love something new and unique to the eye. What makes this glass unique is that the bullet attached to the glass is 100% authentic. You can now drink your favorite liquor with a bullet-proof glass. If you’re a fan of the Game of Thrones and a fan of drinking hard drinks, then you might want to try this whiskey glass. The Game of Thrones Whiskey Glass by Integrity Bottles is the ultimate gift for those who love to watch the Game of Thrones. The words or text that’s engraved on the glass is being made with sand-carved and deep etch method. Because of this the text will never fade or erased from the glass. You’ll have no problem with the glass because it’s made with premium materials. We all know that liquor and cigar go hand in hand. That’s why for those who’re looking for the perfect glass to drink and smoke this is for you. The Cigar Glass by Corkcicle is the perfect combination of drinking and smoking. The glass has a built-in cigar rest that could fit any cigar. Durable and made from high-quality materials, you don’t have to worry about breaking it. The glass holding the cigar is also handmade and made with quality materials. If you’re tired of the same old designs, here’s something that might pique your interest. The Carre Square Scotch Glasses by JoyJolt is a square design handmade Scotch glass that has a strong frame and glass. This old-fashioned glass is the best gift for those old-school drinkers. You can now savor the finest liquor in the market in this handmade Scotch glass. The base of the glass is thick so you don’t have to worry about breaking it. What makes this product stand out is that it’s dishwasher safe. Diamonds are forever and so is your favorite liquor. 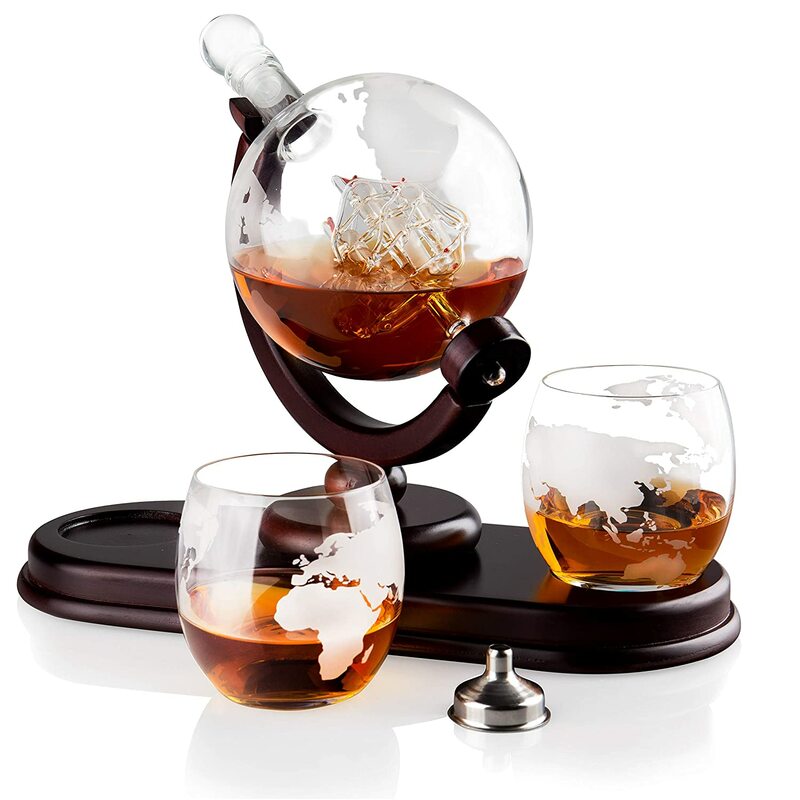 This gravity-defying glass is being made with the finest materials and crafted by professionals. The design is fancy and elegant perfect for those with great taste. It’s the ultimate gift for your alcohol-loving friends. What makes this glass stand out is that it has a gravity-defying design. The shape resembles a diamond that doesn’t spill when you tilt it. The quality of the glass is superb and it’s dishwasher friendly and easy to clean. How’s your day? Express your mood with this unique glass when you’re drinking. Everyone has his own up and down, the important thing is that you express what you feel. With this glass, you can show everyone what your current mood is without uttering a word. The Good Day, Bad Day Whiskey Glass by Frederick Engraving is a mood glass that has a quality engraving that doesn’t get erased easily. Made with durable glass and a permanent engraving, this glass is the ultimate mood setter. What About You ? Tell me in the comments below your favorite one ! True, Gotta love the vintage look of the mason jar!